When it comes to separating hydrogen from the water molecule, it’s like the old Neil Sedaka song said: “Breaking up is hard to do.” It is so difficult, in fact, that the production of hydrogen gas has been one of the main obstacles in the deployment of fuel cell–based vehicles. A simplified and reliable device developed at EPFL should enable hydrogen production at low cost. Researchers were able to perform water electrolysis without using the expensive membrane placed between the electrodes in conventional systems. Many scientists dream of replacing fossil fuels with hydrogen. As hydrogen does not emit carbon dioxide, it is an ideal transportation fuel and mean for storing the renewable energy of intermittent resources such as sunlight and wind. 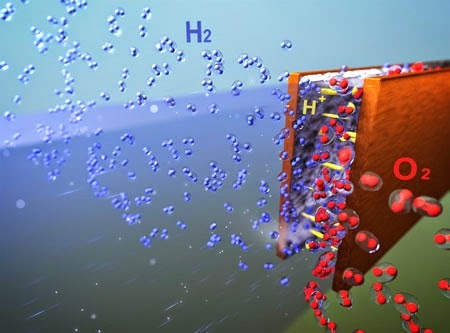 However, hydrogen production, which consists of "splitting" water molecules into hydrogen and oxygen with electrical power, remains challenging, as it is far too expensive to compete with conventional energy sources. At EPFL, the team headed by Demetri Psaltis has come up with a system for producing hydrogen through a simplified and versatile process of water electrolysis. By playing with the balance between fluid mechanic forces, the researchers showed that it was possible to do without the expensive membrane that sits between the electrodes in the traditional systems. In a conventional system, two electrodes are submerged in water and separated by a polymer membrane. An electric current is sent through one of the electrodes (the cathode) and then travels to the other (the anode). The current, with the help of a catalyst, causes the water molecules to break apart into oxygen and hydrogen. To prevent the two gases from mixing together and making an explosive mixture, polymer membranes are implemented between the catalysts to keep the gases separated. In both research and industry, membranes used for ionic conductivity are most commonly made of Nafion, due to its great stability and ion conductivity. However, they are expensive, have a limited lifetime and only work in highly acidic solutions, which limit the choice of catalysts. To rid themselves of these constraints, the scientists placed the electrodes less than a few hundreds micrometres apart in a microfluidic device. When the liquid moves above a certain speed between the electrodes, the gases are pushed in opposite directions - thanks to the lift forces caused by an effect known as Segré-Silberberg effect - without the need for a membrane to guide them into separate outlets. This design sets the stage for the production of devices that work with all types of liquid electrolytes (containing ions) or catalysts, since there is no longer the risk of damaging the components due to a highly acidic environment. This versatility is not possible in conventional systems, in which only catalysts made of noble metals like platinum can work with the low pH values imposed by the membrane. "Our device has the potential to surpass the performance of a similar water-splitting apparatus that relies on an ion conductive membrane. This is due to the higher ion conduction in liquid electrolytes than in common solid membranes", says Mohammad Hashemi, the first author of the paper. The same team is now working on scaling up the design for higher production rates. As the only dimension that needs to remain small is the inter-electrodes distance, it is possible to implement the same concept using high surface area electrodes as side walls of narrow electrolyte channels." This discovery was recently published in Energy and Environmental Science.